Education credits (American Opportunity Tax Credit and Lifetime Learning Tax Credit) from IRS Form 1040—line 50 or 1040A— line 33. Child support paid because of divorce or separation or as a result of a legal requirement. Don’t include support for children in your parents’ household, as reported in question 73. Your parents’ taxable earnings from need-based employment programs, such as Federal Work-Study and need-based employment portions of fellowships and assistantships. Combat pay or special combat pay. Only enter the amount that was taxable and included in your parents’ adjusted gross income. Don't include untaxed combat pay. Earnings from work under a cooperative education program offered by a college. 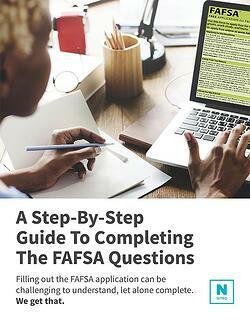 The FAFSA asks about your parent’s / parents’ additional financial information as a way to gather any relevant earnings or payments that would not show up on a Federal tax return. Child support: Check this box if your parent/parents paid child support to a dependent for whom they do not have primary custody. (This dependent may or may not also reside with you). This may be court ordered as a result of a divorce or separation. Then enter the amount paid. Taxable earnings from need-based employment programs: Check the box if they received earnings such as Federal Work-study and need-based employment portions of fellowships and assistantships. Then enter the amount received. College grant and scholarship aid reported to the IRS: Check the box if they received outside scholarship/grant sources. This is not a scholarship offer which a college will offer to them, whether merit or need-based. They can find this figure on their tax return as a deduction as part of their Adjusted Gross Income. Then enter the amount received. Combat pay or special combat pay: Check the box if your parent/parents have listed this figure on their tax return as a deduction as part of their Adjusted Gross Income. They should not report untaxed combat pay, which would be reported on their W-2. Enter the amount received. Cooperative education program earnings: Check the box if your parent/parents earned money from cooperative education programs (also known as co-ops) while working in a experiential learning environment outside of a classroom. Then enter the amount received.